Indulge in 50 shades of naughtiness! 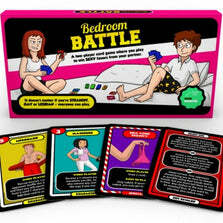 This very original game comes fresh from the studios of Creative Conceptions, the highly respected designers behind the popular game Monogamy. Fifty Days of Play can be played night after night and will explore the boundaries of your sexual relationship.